Running is not simply an exercise. Running is a lifestyle, and that is exactly what ON Apparel and Clothing believes! ON is a Swiss company that has one goal, “to revolutionize the sensation of running with their innovative design. On focuses on providing the sensation of running on clouds with their shoes, this ensures comfort and support while exercising. Starting in Zürich, Switzerland in 2010, ON is a small company that has big ambitions. After creating their first few cloud performance designs, they soon took off within the running community, and have created quite the name for themselves. Fast forward to today, ON shoes are being worn by over 3 million runners and on 50 different countries. To help prove that On shoes are designed for runners by runners, ON has sponsored a series of extremely successful Ironman and Marathon athletes. In 2014, Ironman athlete Frederik Van Lierde won the Iron Man World Championships while wearing the ON Cloudracers running shoes. What Are the Benefits of ON Running Shoes? Ever since their creation, ON shoes have been pushing the envelope in terms of innovative technology for running. Because running can be a gruel and grinding sport while training for a big event, On Shoes has dedicated their products to to reducing stress, and providing their athletes the lightweight and cushioned designed they deserve. The three things that ON Shoes focuses on is Soft Landings, Explosive Take-Offs, and A Sole for Every Surface! Soft Landings: ON Shoe’s focuses on providing the ultimate lightweight running sensation. They provide cushioning on your shoes that adapts perfectly to your stride. When your foot makes contact with the ground, these shoes help to cushion and disperse the stress both vertically and horizontally across the shoes. This helps to reduce stress on your joints and muscles, and allows you to run further and harder! Explosive Take-Offs: ON Shoes provide their legendary “CloudTec” technology which offers cushioning only in the front of the shoe, which means it only absorbs and cushions during the landing phase of your stride. This means that as soon as you make contact with the ground the Cloud Elements of the sole provide a firm and solid foundation to explode off into your stride. A Sole for Every Surface: Along with this ON Shoes provide 3 different soles which are designed for different surfaces and types of runs. They provide Zero-Gravity Foam soles which are extremely light and ensures superior grip. They also provide Rebound-Rubber which is designed to provide you with extreme durability and a reliable cushioning design. Along with this ON Shoes provides a Micro-Engineered Grip-Rubber sole that is designed for the unpredictability of the trails. This sole provides four distinct levels of grip that are designed to truly keep you in control, and keep you from slipping. That being said, there are quite a few reasons why ON Shoes have taken off as some of the best running shoes available. I have used ON Shoes for quite some time and they are some of the most comfortable and innovative running shoes that I have ever used. That being said I have reviewed a few of ON Shoes below, and you will definitely be able to find the best ON shoe for you. To start off out list we have to begin with the classic, the ON Men’s Cloud Sneaker! This shoe was the first shoe that ON started producing, and it really is their staple behind their brand. 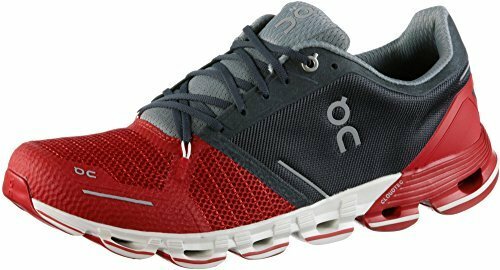 This lightweight running shoe is designed to be an all purpose running shoe, that features the patented CloudTec sole which gives you the smoothies ride possible. This shoe is designed to be the best of both worlds, for both performance and comfort. It is the perfect everyday shoe. The Cloud Sneaker was the first shoe by ON to feature a more forward foot strike which allows you as a runner to feel more in control of your center of gravity, and also reduces stress on the joints, and allows you to run further with less effort. Along with this, ON prides themselves on their combination of injury protection along with their lightweight design. Part of this is due to the CloudTec sole, which gives you cushiony cloud elements in the right areas to help absorb impacts, and grip pads to help keep you in place. The ON Men’s Cloud Sneaker is designed out of lightweight synthetic and mesh material on the top, and the new CloudTec sole on the bottom. This gives it an extremely lightweight design which only weighs 8.1 ounces. Along with this, this shoe features extremely comfortable sock liners, which gives you an unmatched step-in feel when first putting them on. Along with, the heel area features a “V-Molded” design which is extremely fitting instead of rigid, which allows the shoe to form to your foot, and prevents blisters and slippage. One of the functions of this shoe that I always thought was extremely cool, was ON’s speed lace entry. This design allows you to simply and easily slip the shoe on without having to tie your shoes at all. Even when unlaced, these shoes will have a great snug feel, that won’t fly off when you’re walking or running. Overall the Cloud Sneaker by ON is one of the best everyday shoes by ON. These shoes combine the performance and ability of a running shoe, with the comfortable and stylish looks of street shoes. You can just as easily go for a run around the neighborhood as you can wear these shoes to work. 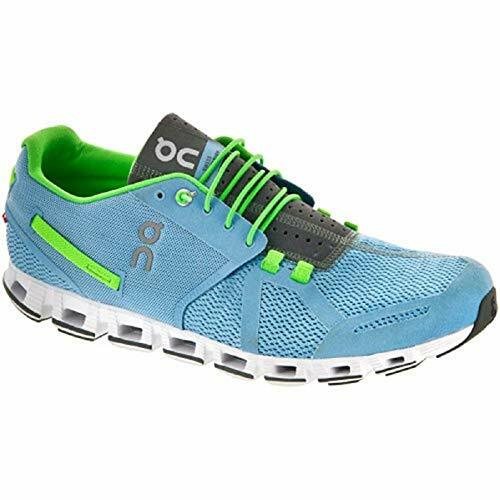 If you are looking for everyday shoes that have the ability to do it all well, then I definitely suggest these Cloud Sneakers by ON. 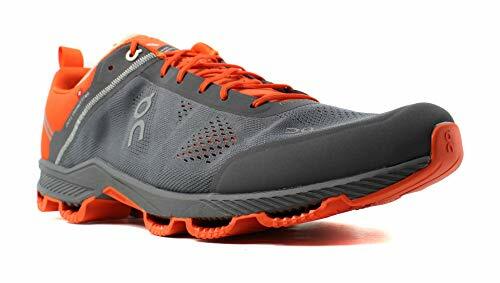 The next shoe on our list is the ON Cloudsurfer Performance Running Shoe! This Cloudsurfer shoe is designed to be as a performance shoe compared to the hybrid of the previous ON shoe. The Cloudsurfer is designed with runners in mind, and is designed to increase performance, increase training ability and reduce stress on your joints and muscles. One of the great features of the Cloudsurfer is its lightweight and breathable design. The shoe is uniquely manufactured with mesh along the sides to help provide breathability, but also provide support in just the right places. Along with this, these shoes are crafted from a single layer of mesh to help give you a nice comfortable fit. Furthermore, the inside of this shoe features a second layer sock that helps bind to your foot unique size and shape and gives you a completely personable fit to your shoe. Along with this, the overall weight of this shoe is just 8.5 ounces. These shoes are some of the more comfortable shoes that I’ve tested so far. They really don’t need to be broken in. The first time I wore them I went for a quick 5-mile jog, and I didn’t feel any feeling of blisters or uncomfortable rubbing. Along with this, the cushioning systems does a great job of preventing and reducing any injury through stress of foot to ground contact. That being said, just because this shoe is extremely comfortable, doesn’t mean it doesn’t pack some of the best performance features that we’ve seen in a running shoe! This shoe features 13 separate support shock absorbers that not only absorb stress, but also help to give you a firm platform to explode off into your stride. These supports not only protect your feet, but I have noticed dramatic reduced stress on my knees and ankles after using these shoes for extended runs (15 miles+). With these shoes, you receive an almost springy sensation that allows you to be more efficient and actually allows you to run further and reduce energy consumption. Overall, the Cloudsurfer is a great shoe for those that are looking for a more performance based shoe. The Cloudsurfer features cushioning and support technology that not only helps protect you from injury, but it also can make your running stride and ability more efficient. That being said, some users have complained that the Cloudsurfer is heavier than some other pure performance shoes in the market. That being said, the Cloudsurfer is an amazing option for those that are looking for extremely comfortable everyday running shoes, and there are better options below for those looking for extremely lightweight performance running shoes! If you are looking for a long distance running shoe that will keep you protected, and allow you to go the distance, then you need to try the ON Cloudflyer running shoe! This updated design allows for a brand new lighter weight shoe that reduces your legs and hips inward rotation which helps to keep you more stable and protect your knees and ankles from injury. One of the main factors you want to look for when you are looking for long distance shoes, is comfort and support. This shoe has a dual density sock liner which helps to provide even more comfort and protection. Along with this, these sock liners help to prevent any slip or sliding inside the shoe, which helps to reduce the risk of blisters. As for support, the Cloudflyer features a state of the art memory foam insole which keeps your foot stable and cushioned on long distance runs. Along with this, this shoe features a “V” shaped molded heel cap which helps to provide a cushioned support for your foot, and keeps it firmly in place. This shoe is unique for a long distance running shoe because it features a huge amount of support and stability for your ankles, knees and feet all while keeping the weight extremely low. This shoe weighs a total of 8.9 ounces, and really doesn’t feel bulky or heavy while you run. One of the last things you want on a long distance run is to feel like your shoe is weighing you down, and with the Cloudflyer, you’re given enough cushioning and support to keep you running for quite a while. Another unique feature of the ON Cloudflyer is the laces. Shoe laces have been relatively the same for the past 50 or so years, but this lacing system can change it all. The “Star Lacing” system by ON provides an extremely comfortable and supportive design, that actually creates a more personal fit than traditional lacing systems. Overall if you are looking for a long distance running shoe that not only features cushioning and support features to keep you safe and running further, but you also care about the weight of your shoe, then you should definitely take a look at the ON Cloudflyer running shoe! This shoe is a perfect combination between comfort, stability and weight, and gives you an ideal long distance running shoe that will keep you safe and comfortable, no matter the distance! ON Running Shoes and Apparel is an extremely unique and innovative brand designed for runners by runners. ON provides a variety of different shoes that not only are extremely comfortable, but they also have introduced technology that increases a runner’s efficiency. With the introduction of the CloudTec sole, runners are given a new range of support for not only their feet but for their entire bodies! This unique design allows a huge amount of the stress of running to be safely dispersed throughout the sole of the shoe, which ends up reducing the amount of stress that is transferred to your body. This allows you to run further, faster, and harder than you ever have before! Overall, ON provides running shoes that are great for nearly any runner! They have shoes which are designed specifically for those who are looking for a combination of everyday shoes but also want to use it to run once in a while. For those types of runners, I would definitely suggest taking a look at the original ON Cloud Sneaker. That being said, for those that are looking for race type shoes I would definitely check out the ON Cloudsurfer or the ON Cloudflash which we didn’t review. Finally, if you are looking for a long distance running shoe, then I would definitely suggest the ON Cloudflyer because of its extreme support and cushioning, which will keep you running further and harder. Overall, ON provides some great running shoes, and I’m sure you’ll find something perfect for your needs! Brett is a running junkie & fitness blogger based Raleigh, NC. Brett loves traveling the World to run marathons and is currently training to run a desert marathon in 2019.